The Haribon Foundation for the Conservation of Natural Resources, Inc. headed by Noel A. Resurreccion went on a learning visit to the Mt. Isarog Natural Park (MINP) on May 9, 2018. This visit is intended for the Naujan Lake National Park (NLNP) stakeholders, for them to learn and understand the best practices in MINP specific to the organization and maintenance of the Bantay Gubat locally known as the Mt. Isarog Guardians (MIGS). The said activity is in line with Haribon’s implementation of a USAID-funded capacity building project in Oriental Mindoro. The goal of the project is to strengthen the capacity of local conservation actors in managing the sub-watersheds of NLNP. 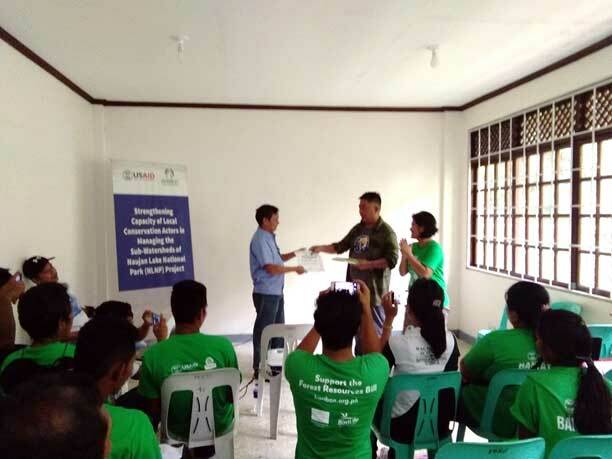 One of its major interventions is the formation and training of the Bantay Gubat, a group that will closely work with the Department of Environment and Natural Resources (DENR), Local Government of Oriental Mindoro, and the local communities. Meanwhile, the Metropolitan Naga Water District (MNWD) representatives Vicente Aniceto D. Rubio, ADMA Environment and Water Resources Division and Pedro B. Prima Jr., Forestry Assistant, attended the Learning Visit and shared the origin, roles, and responsibilities of MIGs. They were also present during the said event and interacted with the visitors from NLNP. In addition, Mr. Rubio imparted the experiences and best practices of the MINP program. He also shared the impact of the MIGs in the sustainability of the environmental integrity of watersheds within the MNWD’s service area. Haribon Foundation is a pioneer environmental organization in the Philippines formed back in 1972 with the vision to transform every individual into a biodiversity champion. Also, the group is an active advocate of biodiversity conservation through building constituencies, empowering communities, and applying multi-disciplinary research. THE LEARNING VISIT. Mr. Vic Rubio sharing MNWD’s experiences and best practices in sustaining the Mt. Isarog Guardians at MINP Protected Area Office, Panicuason, Naga City.